Digestive problems for women can be unsettling and frustrating, especially when they occur during times of hormonal imbalance, such as during menopause, when you may also have other symptoms to deal with. Fortunately, though, there are things you can do in order to aid your digestion. 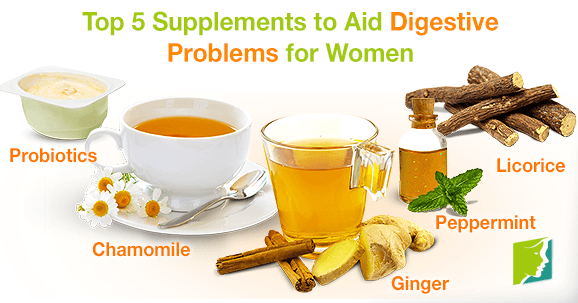 One of these ways is to take supplements that help to relieve digestive problems in women. Continue reading to discover the top five supplements to take. Probiotics contain beneficial bacteria, which are essential for helping your gut with digestion. The living organisms contained in probiotics, namely bacteria and a type of yeast, are thought to help restore the digestive tract's natural bacteria. Probiotics are particularly good for relieving symptoms of irritable bowel syndrome and diarrhea. Ginger has been used to treat digestive ailments since ancient times. For hundreds of years, it has been considered one of the best ways to ease a stomachache, calm nausea, and reduce bloating. Ginger supplements are very popular, and therefore are available to purchase in tablets or gel capsules, or even as a powder to mix into a different hot drink. Alternatively, a piece of ginger root can be ground or chopped and added to boiling water to make a strong and zesty herbal tea. Peppermint essential oil is said to be very effective in relieving the symptoms of one of the most commonly experienced digestive problems women face, irritable bowel syndrome. Since essential oils are pricey and make it hard to control the dosage, peppermint supplements are an easier alternative. If possible, look for supplements in gel capsule form, as these release the oil once the reaches your intestines, helping reduce inflammation. Chamomile is not only a great way to help to ease digestive problems in women, but it also makes a great-tasting tea. As well as helping digestive problems like upset stomachs, it can help relieve the symptoms of anxiety, nausea, and insomnia. Try replacing your usual coffee with a cup of chamomile tea to find relief from digestive problems. Licorice is thought to be an effective way to ease the symptoms of digestive problems such as acid reflux and heartburn. Taken in both supplement and herbal tea form, or raw with food, licorice can help towards easing digestive ailments. Although all of these supplements are natural, herbs and probiotics can still cause side effects or interact with medications or other herbs. Check with your physician before taking any supplement. Many women suffer from digestive problems, which can be frustrating and annoying. However, there is no need to simply suffer from this. Taking natural supplements is one way to give your body a helping hand towards recovering good digestion. Chevallier, A. (2000). Encyclopedia of Herbal Medicine. London: Dorling Kindersley Adult. Srivastava, J.K. , Shankar, E. & Gupta, S. (2010). Chamomile: A herbal medicine of the past with bright future. Molecular medicine reports, 3(6), 895-901. doi: 10.3892/mmr.2010.377.